In this, the officially Most Bananas of all the Star Trek movies, a crazed cult-leader steals the Enterprise and her crew and takes a joyride to the centre of the galaxy to… find… God? I would love to know the anthropological reason for why fiction always visualizes “god” as Giant Floating Head. 1. Spock’s long-lost full-Vulcan half-brother, Sybok, lands on the beleaguered Planet of Galactic Peace, aka: Nimbus 3, which as a treaty condition many years ago was declared the shared property of the Klingon and Romulan Empires, and Earth, to be developed jointly (guess how well that went). 2. 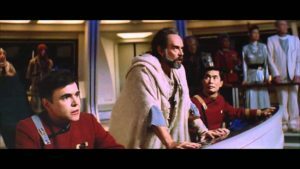 Sybok uses Vulcan telepathy to brainwash the planet’s wretched hive of scum and villainy and the three ambassadors to his cause, and lure the Enterprise in so he can hijack it. 3. Sybok directs his captives (and followers) to take the Enterprise into the deadly galactic core, where apparently… god… lives. Except, SURPRISE, it wasn’t really god at all, but a captive super-alien who’s possibly been lying to Sybok for years to trick him into staging a cosmic jailbreak, all to drive home the lesson that so many episodes of Original Series has taught us, namely: Just Steer Clear of Ascended Assholes, They’re Trouble. And people who worship said ascended assholes. Especially if they dress like this guy. This is one of those stories where there’s anywhere between one and five really interesting potential stories that never really got made, because story-wise, this movie is a mess. The underlying mythology Sybok is following suggests that the “god” worshiped on dozens of planets is in fact the same incomprehensibly powerful alien entity, and he just has to meet them. Like, that’s interesting! 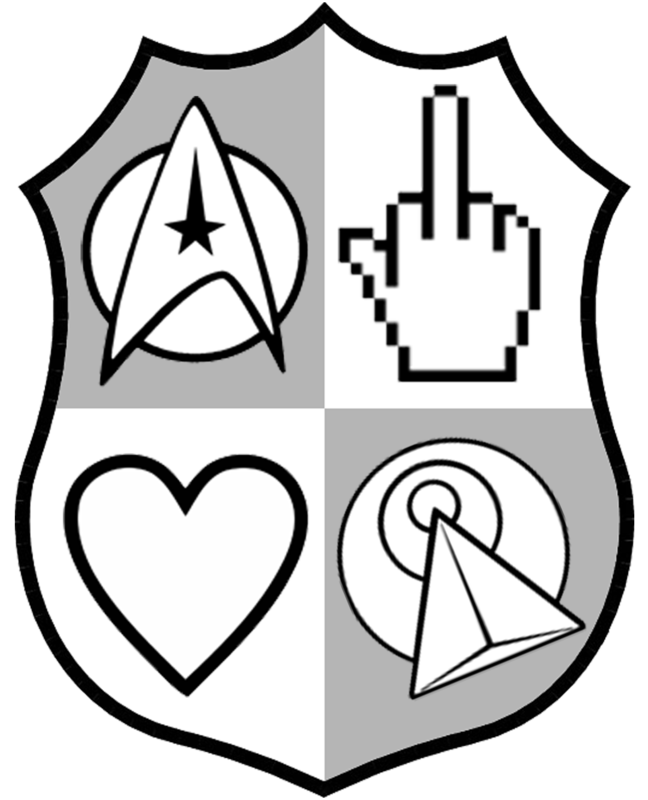 Especially through the lens of Roddenberry’s die-hard atheism. Of course, in the movie, this turns out to have all been a tragic scam, but it’s also worth noting that Star Trek canon does later firmly establish a creation story for at least half a dozen humanoid races, including humans, Klingons, Romulans, and Cardassians, in the form of a seeded-by-a-dead-race in the vein of Stargate’s Alterrans, in the sixth-season TNG episode The Chase, and IMHO it was a far more interesting take on the whole is-there-a-higher-power question, and a much more Star Trek one. However, we are willing to forgive almost anything for some high-quality character shenanigans, and this movie has that in spades. The story is totally crazy, but the movie contains a solid half-hour, collectively, of Kirk, Spock, and Bones hanging out during leisure time, camping, and later on, wacky shenanigans and decades-of-friendship banter as the trio lead the cultists on a merry chase through the Enterprise’s back corridors, avoiding capture. There’s also some genuinely affecting bits and pieces where Sybok, flummoxed by the way the unusually strong bond between the trio makes them resistant to his brainwashing, tries to apply his shtick by dragging up everyone’s most painful memories for display to the others and then offering to take the pain away – something that mostly just a) pisses them off and b) makes them more irritatingly loyal to each other. The friendship between Kirk, Spock and Bones is the only consistently structured thing in the movie, and the only one that’s satisfyingly circular. Basically, friendship literally is magic, right up to the front lines defeating a false god. This camping = the polar opposite in quality to the camping in the last Harry Potter novel. Star Trek: The Final Frontier. Come for the crazypants religious commentary, but stay for the group hugs. Next week: the final TOS movie, The Undiscovered Country. After that, we’ll be taking a brief hiatus for the rest of the summer, or until Discovery begins. When will that be? Probably September! But watch this space for updates.